If 2016 endures in American history as a year of epochal disaster, then it will be fair to ask, in the grim years to come: how on earth could artists have joked around so much while the darkness gathered? But in a year whose most debated exhibition came from a quartet of dim New York fashion dropouts who laugh about fascism, one painter, 33 years old, born in Nigeria and working in Los Angeles, has been mapping the route to somewhere braver and more important. 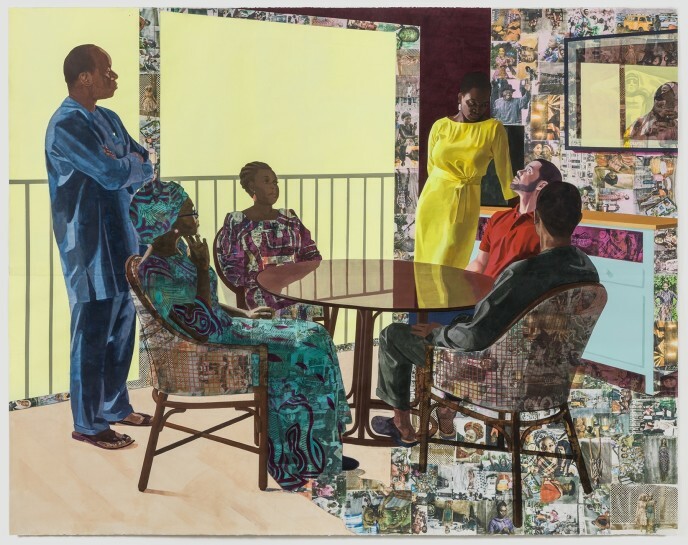 Njideka Akunyili Crosby’s crowded but deeply assured paintings absorb wholly different styles of image-making into exquisite, syncretic artworks, and though her scenes are hushed, her ambition is blazing. When too many young artists go small, she plays the long game – putting western art history in the service of a new, transcultural imagination with herself at its nucleus. I Refuse to Be Invisible was the apt title for this poised exhibition, her first proper museum retrospective, and indeed almost all of Akunyili Crosby’s paintings are autobiographical. The artist appears with her family at kitchen tables or on overstuffed couches, in an easy, unruffled manner that recalls the work of her teacher at Yale, the great figurative painter Catherine Murphy.